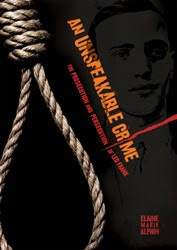 An Unspeakable Crime: The Prosecution and Persecution of Leo Frank by Elaine Marie Alphin. Carolrhoda Books (Lerner Publishing Group), March 2010. Was an innocent man accused of murder? On April 26, 1913, thirteen-year-old Mary Phagan planned to meet friends at a parade in Atlanta, Georgia. But first she stopped at the pencil factory where she worked to pick up her paycheck. Mary never left the building alive. A black watchman found Mary's body brutally beaten and raped. Police arrested the watchman, but they weren't satisfied that he was the killer. Then they paid a visit to Leo Frank, the factory's superintendent, who was both a northerner and a Jew. Spurred on by the media frenzy and prejudices of the time, the detectives made Frank their prime suspect, one whose conviction would soothe the city's anger over the death of a young white girl. The prosecution of Leo Frank was front-page news for two years, and Frank's lynching is still one of the most controversial incidents of the twentieth century. It marks a turning point in the history of racial and religious hatred in America, leading directly to the founding of the Anti-Defamation League and to the rebirth of the modern Ku Klux Klan. Relying on primary source documents and painstaking research, award-winning novelist Elaine Alphin tells the true story of justice undone in America. And that's it for my mailbox this week! Did you get anything exciting in the mail or bookstore this week? Now that book sounds like the kind of nonfiction that I could read. I'll be eager to hear what you think of it. My best additions this week were two books a student lent me. He is letting me read #8 and #9 in the Ranger's Apprentice series long before the books are published in the US. But the wait for #10 will be so much longer now. This sounds fascinating -- and heart-wrenching. I look forward to reading your review. You know Elaine Marie Alphin is from Indiana, right? She's wonderful - she led a workshop for me once. I used to work at the Atlanta historical society (Atlanta History Center) in the archives, and they have photos of Leo Frank's body hanging from a tree. Someone had made them into postcards at the time(that Frank was hung). Horrifying. Interesting book you got this week. Hope you enjoy reading your book. That sounds like my favorite kind of non-fiction - that which includes a mystery/case to solve. I'm definitely going to pick this one up.